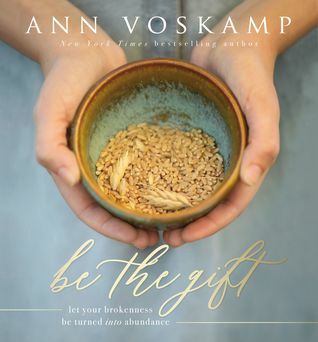 Ann Voskamp's new book Be the Gift is not an easy read, I think, however, it is one with an important message for those who are able to read it. Ann's style appears to be a collaboration of story and parable, honest vulnerability and hard truth. It's this hard truth that makes this book so very valuable. I loved Ann's honest look at brokenness, her passionate pointing back to Christ, communion, and the church when it comes to the hard and the messy in life. This message of hard and messy things needs to be paired with the beauty of giving, koinonia, and eucharisteo to be real in our messy,human lives. In light of Ann's gift in storytelling and parable this message comes across in a way that blends this truth with everyday experience and emotion in a venue that makes her words seem tangible. That said, I know some will (and do) struggle with Voskamp's writing style.With her unconventional presentation, wordy vocabulary, and unusual transitions some readers may find Voskamp's work difficult to track with which is okay, not everyone learns from a storytelling perspective. Voskamp's work requires patience and alertness (this is definitely not a midnight binge read) to absorb the full impact of her words, not to mention the possibility of a second read through. The book, itself, seems to be aware of the weightiness of its words and the time required to process their meaning. As a result, the text is inter-spaced with beautifully shot pictures of life and light that give balance to the message which surrounds them. Overall, I appreciated Be the Gift and found its message to be one that I will return to again.